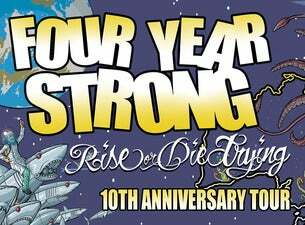 FOUR YEAR STRONG have announced that they will be extending their visit this January, taking Rise or Die Trying on the road to celebrate the album’s 10th anniversary. Special guests on all dates on their UNIFY sideshows will be Kentucky natives, KNOCKED LOOSE. My Live Nation members can secure tickets first during the exclusive pre-sale beginning at 10am, September 21. For complete tour and ticketing details, visit: livenation.com.au. "In 2007 we put out a record called Rise or Die Trying, starting us down a path that would lead us all over the world, and drastically change our lives. With 2017 marking the 10 year anniversary, it's time to say thank you. Thank you to everyone that came out and supported our young band, thank you to everyone who still goes crazy at shows when we play RODT songs, and thank you to a record that gave us these last 10 years. They kept true to that promise and will be touring the record Down Under on the back of their appearance at UNIFY 18 in January. The announcement also follows the release of their acoustic b-sides record Some Of You Will Like This // Some Of You Want via Pure Noise Records. Label mates KNOCKED LOOSE released their debut album, Laugh Tracks, in 2016 and will return in 2018 after previously touring with Stick To Your Guns in January 2017.